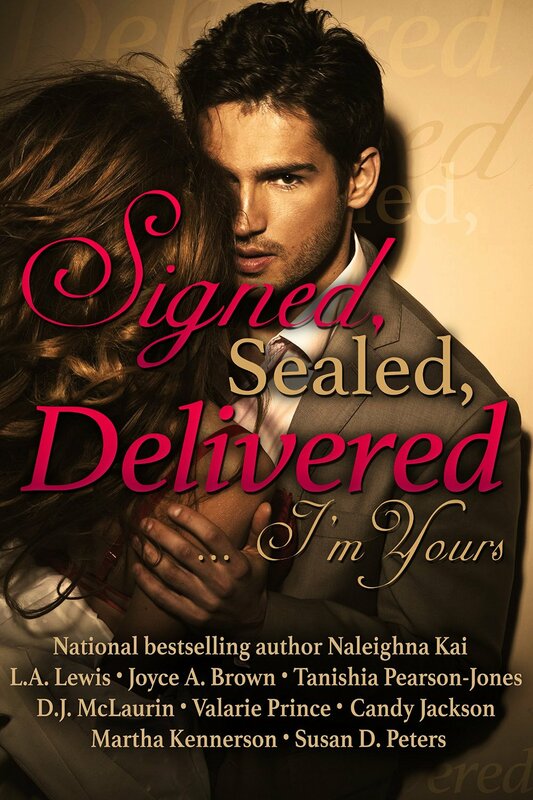 EXCERPT FROM You’ve Really Got a Hold On Me by L.A. Lewis from the romance anthology: Signed, Sealed, Delivered … I’m Yours by the talented members of M-LAS. “It’s been three weeks, Melanie. Why don’t you just call him?” Casey’s gaze shifted from the last cupcake to the bag of donut holes and piping hot cup of coffee sitting on the table. Gavin used to come in every morning before the start of the business day for his daily sugar fix—donut holes and coffee. “He walked out on me,” Melanie said with a lift of her chin, embarrassed that she was still such a creature of habit. “He can call me if he wants to talk. He can call me if he misses me.” Her voice caught at the end of those words. She wanted to sound strong, but instead she sounded … scorned. Casey grimaced and shrugged. “Fine, just keep preparing his usual if that somehow makes you feel good.” She stepped away, looked at Melanie over her shoulder, then disappeared into the kitchen before Melanie could say another word. “Whatever,” Melanie mumbled as she slumped against the counter. Being without Gavin was a bigger challenge than she imagined. He’d been a part of her life for so long, she’d become so used to calling him and looking to him for an encouraging word when she needed one. His touch was always so comforting and welcoming. These past few weeks she’d thrown herself into the business and stayed in her kitchen from sunup to sundown trying out new recipes. But even that was a constant reminder of his absence. He had a big appetite and was always available and eager when she needed a taste tester. She unlocked the door then stormed toward the kitchen, hoping to put distance between herself and her memories. She stopped when the door chimed. “Good morning.” Gavin’s baritone voice, which still carried a hint of disappointment, traveled from the front door all the way to the counter. “Good morning,” Melanie answered, trying to keep her voice level and her hand from trembling. She opened the display case and began to rearrange the already perfectly aligned cupcakes. Melanie nodded, appreciating his concern. She slid his items across the counter. “Can I talk to you for a minute?” Gavin asked. His slight nod was followed by a quick once-over, as though he was trying not to linger in certain places too long. Melanie ushered him through the door to a spacious office in the back of the bakery. He offered a quick greeting to Celeste who gave him a knowing smile. “I don’t either,” she said right before he placed an index finger over her glossed lips. His touch sent a tingling sensation through her body, one that was as welcome as a snowball on a hot summer day. As though hearing her thoughts, he reached for her, but then let his hands fall to his sides, as though realizing he didn’t have the right to do that any longer. He stepped forward and closed the gap between them. Melanie’s heart beat at a rapid pace, and her breathing came in a close second. The palms of her hands turned sweaty. She couldn’t understand why her body and mind were sending totally different signals. Even though Melanie’s heart still ached for Aaron, her body was calling for Gavin.